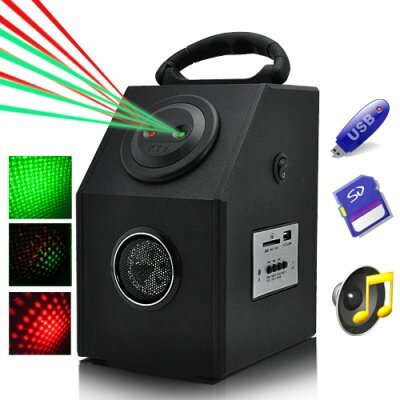 Successfully Added Laser Effects Projector + MP3 Player to your Shopping Cart. At a fraction of the price if sold separately, this Laser Effects Projector + MP3 Player combines a high quality speaker, an MP3 player, a Radio, and a laser effect projector all in one. With its amazing light show effects and music playing function, it will bring life instantly to any environment where it’s used. Amazing light show: the Laser Effects Projector + MP3 Player casts it's mesmerizing lighting display up to your ceiling and around your room. The changing patterns and colors that are projected are simultaneously alien and soothing. For the best light show experience, the device should be activated in complete darkness where the subtler, more meditative and organic beams will be seen. Music Playing and Radio: for even more amazingness, the product also supports MP3 playing and radio functions. Just plug in your USB thumb drive, MP3 player, or SD card, it will play music directly – no need to press any button, no need to change mode! Or just turn on the radio to listen to your favorite programs. The built-in sound activation function will pick up the beats of the music that’s playing through the MP3 player and respond in changing light show patterns. This Laser Effects Projector + MP3 Player will make a great addition to your interior decorations whether you own a pub or a retail store. It is also a great tool for increasing customer interest. Best yet, if you are throwing a house party, rave or any other kind of activity then this product will provide the ultimate environment for having a good time. This Laser Effects Projector + MP3 Player is now available in stock for immediate shipment worldwide. It also comes with our famous 12 month product warranty. Add it to cart and order today! We will express ship it out tomorrow. Brought to you by your source of China factory direct electronics – Chinavasion. What type of music file does this product play? It plays music files in MP3 format. Can I change the patterns to my own designs? No, this product comes with default designs that cannot be changed. If you plan on making bulk orders (100+) of this unit, however, please contact our CS team and we may be able to help.